In this article we examine the importance of dynamic pricing for airlines, what it takes for airlines to engage in dynamic pricing and introduce the airline dynamic pricing engine. It seems that ‘dynamic’ is a word that trips off the tongue of everyone in the industry today. And the word ‘data’ is as ubiquitous as … well, data itself. So, what’s all the buzz about? After all, airline revenue generation has been about ‘dynamic’ and ‘data’ for decades. In the early 1970s, Ken Littlewood was working at British Overseas Airways Corporation (BOAC) when he happened on the idea of a decision rule for selling discounted flights. The opportunity to develop an algorithm for “Littlewoods Rule” was enabled by a new reservations system at BOAC, and sowed the seed for future data-driven, dynamic pricing initiatives. Fast forward a few years to the 1980s. Spurred by price de-regulation and the concern over low cost entrants to the US market, American Airlines took dynamic pricing to the next level when it invested in enabling technology called DINAMO. Then-CEO Robert Crandall introduced the practice of dynamically adjusting a price based on seat availability. This new practice was christened ‘yield management’ and netted the airline an additional $500MM per annum. As is often the case, these evolutionary milestones were born of the marriage between a great idea and enabling technology. ‘Dynamic’ and ‘data’ remain at the heart of revenue opportunity for airlines. But it’s no longer about adjusting price based on availability using static filed fares and 26 RBDs. It’s about dynamically creating and strategically pricing offers in real time based on a host of data inputs. With enabling technology now available, we’ve sprung into another evolutionary leap. That’s what will be explored at the ATPCO Elevate conference. 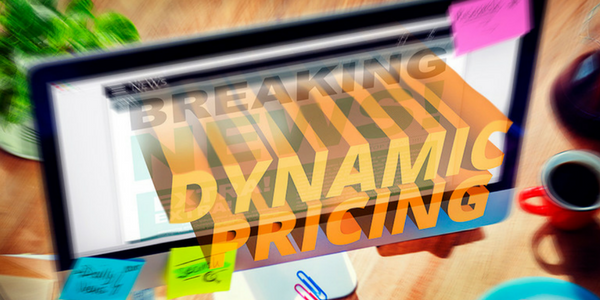 Dynamic pricing requires data, insight, algorithms, and an airline-controlled commerce engine, also referred to as a Dynamic Pricing Engine (DPE). Today’s airline Dynamic Pricing Engines are powered by rules that are created and modified within seconds by business users. It’s important to note that for an airline Dynamic Pricing Engine to work, the system needs to readily scale to manage the volume of input data and the number of booking elements involved. As a rule of thumb, the ‘bigger’ the data and more powerful the analytics, the more granular the price adjustment can be. Traditional engines that are limited strictly to ATPCO filing and fare buckets are not equipped to effectively handle the speed, scalability, or flexibility of dynamic pricing. However modern airline pricing engines can create a sliding pricing scale from starting points such as the ATPCO base fare, bid price, or market price. For more information on this topic, read our recent blog post. From what we are seeing in the market, airline dynamic pricing is still aimed at engaging customer segments, rather than individual customers. But these segments are becoming more finely honed and precisely targeted. As with preceding milestones, the next evolutionary leap of data-driven, dynamic offers will be underpinned by technology. It will also be amplified by science – data science. Artificial Intelligence (AI) and Machine Learning are poised to take us into the next frontier of data-driven offer creation, where the end goal is personalized offers. That’s when the offer is created and dynamically priced for each individual customer. Not only will AI decide which algorithms to apply but it will also learn to write the rules that will create the best outcome. And what of the customer in all of this? Surely the customer would not tolerate different prices for the same product? Well the answer may be that some customers would not tolerate this difference – namely 7% of customers according to recent research published by Forrester. Evidently, these are the customers where price (and nothing else) is King. The report finds that the majority of customers regard price changes as ‘fair’ provided those changes are backed by data science, and one would presume greater perceived value. It’s important that the practice reflects differentiated pricing and not discriminatory pricing. Perhaps it could also be argued that customers have become used to data-driven pricing for decades – since Littlewood was at BOAC. If you are interested in learning more about dynamic pricing for airline revenue management download the New Generation Shop & Price Primer by clicking the button below. How are Dynamic, Personalized Offers Changing Our Industry?